Also pictured below is some parmesan risotto that, along with these great green beans, accompanied seared duck breast… yum! We found this recipe on Realsimple.com – to view the original, click here. Bring a large pot of salted water to a boil. 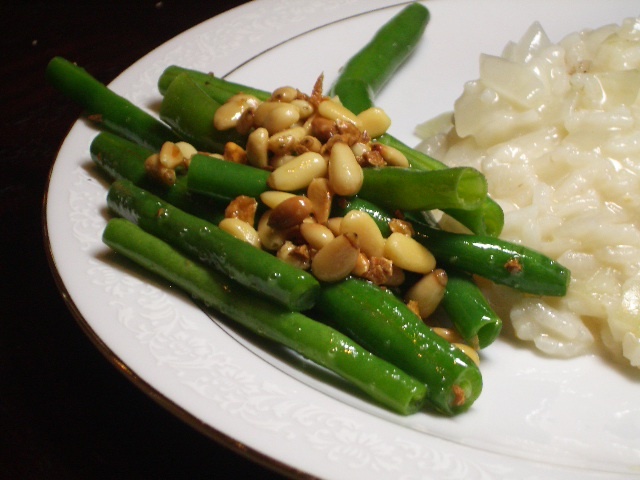 Add the green beans and cook until just tender, 3 to 5 minutes. Meanwhile, heat the oil in a large skillet over medium heat. Add the garlic and cook, stirring, for 1 minute. Add the pine nuts and cook until golden brown, about 3 minutes. Drain the green beans and transfer to the skillet. Add 1/2 teaspoon salt and 1/4 teaspoon pepper and toss to coat. Transfer to a serving bowl.